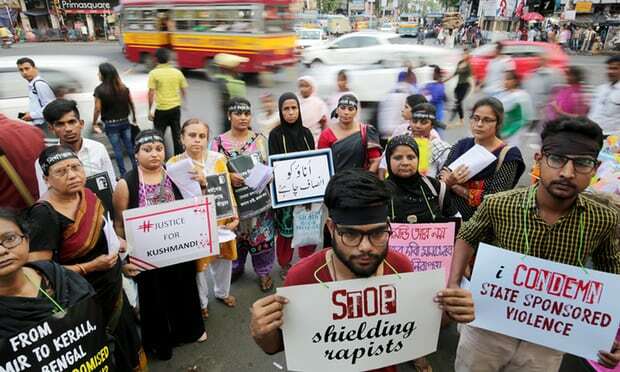 A 16-year-old girl has been kidnapped and gang raped, then burned to death when her family tried to seek justice, in the latest case of horrific sexual violence to emerge in India. Police have arrested 14 men in connection with the assault and murder in eastern Jharkhand state, but the main suspect is still on the run. The teenager was abducted while her family were away at a wedding on Thursday night and raped in a nearby woodland, a local police officer told Agence France-Presse. When her parents returned and she told them what had happened, the family went to the village council. Community elders have no formal legal standing, but carry huge authority in rural areas where people often use them to settle disputes in preference to a legal system that can be slow, expensive and corrupt. The council ordered two men to do 100 sit-ups and pay a 50,000 (£550) rupee fine, a derisory punishment for a crime that carries a long jail sentence under Indian law. It enraged the men, however, and they responded by attacking the girl’s parents then returning to her home and set her on fire, Ashok Ram, the police officer in charge, said.